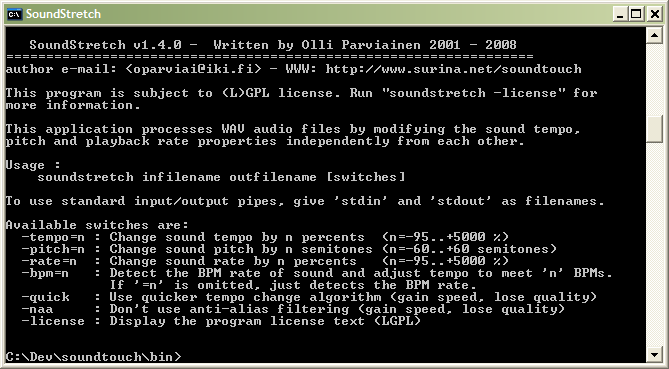 SoundStretch is a command-line program that performs SoundTouch library effects on WAV audio files. The program provides a source code example how SoundTouch library routines can be used to process sound in other programs, but it can be used as a stand-alone audio processing tool as well. The sound Pitch (key) adjustable in range -60 .. +60 semitones (+- 5 octaves). Beats-Per-Second (BPM) detection that can adjust tempo to match with the desired BPM rate. SoundStretch uses the SoundTouch library routines for the audio procesing. All these clips have been created by manipulating original sound file with SoundStretch utility. Beats-Per-Second rate adjusted to 60 BPM (original is 73.9 BPM). Note: This is equivalent to decreasing tempo by -18.8 %. Beats-Per-Second rate adjusted to 100 BPM (original is 73.9 BPM). Note This is equivalent to increasing tempo by +35.3%. Pitch lowered by -3 semi-tones. Pitch raised by +3 semi-tones. NOTICE: SoundStretch processes audio files in .wav file format, but these clips here have been converted to mp3 format after processing to reduce downloading times. The SoundStretch utility is included in the SoundTouch library package. Go to Download page to get the SoundStretch executable file, or SoundTouch source code page to download the source code package. See SoundTouch library README for SoundStretch usage instructions. The SoundStretch utility and the SoundTouch library are open-source software and are released under the GNU Lesser General Public License (GPL) v2.1. The utility and library can be further distributed and used in applications subject to the LGPL license terms.